I appreciate so much for giving precious lectures in New York.I first thought it would be too much for me to attend the 4-hour forum. But because I enjoyed it a lot, I could stay all through. All 4 lectures were distinctive and interesting. Though I did not have little information about Hakuin, they made me understand him well. I was especially interested by your perception of Fujisan. If you allow me to give you the "con side" of the forum, it would be the "rhythm of presentation". The timing between lectures and slides(pictures) were not smoothly synchronized and carried. It was awkward and disturbed my attention. Should you need more comments, please feel free to contact me. I am very looking forward to another forum in the future. I thought the Hakuin program was excellent. The material was interesting and I enjoyed the variety of speakers. The DVD presentation was very high quality and informative. The simultaneous translation was flawless, even during the group discussion.I am glad I was able to attend. I very much enjoyed the forum the first half, that is. In the second session, my translation device did not work, I went up twice to exchange it, and these did not work either. This is unfortunate, as I am a journalist who planned to cover the forum. I have been quite involved with the exhibition Third Mind, am writing a series of essays and interviews with contemporary artists of the '90s who are also Zen practioners, and this would have added to that tremendously. 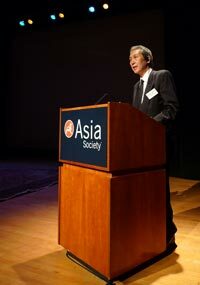 I look forward to the exhibition at the Japan Society. The conference was wonderful! Most especially rewarding was having revealed or explained, the "workings" or inner meanings or symbolic nature of Hakuin's work. This the conference accomplished using different formats, each format enriching one's knowledge. Please continue in the same vein, increasing our understanding and appreciation of Hakuin as an artist. Specifically, I thought it most helpful and engaging to have Tom Kirschner as facilitator, and I appreciated the perspectives of each of the speakers. I was especially taken by the responses of each of you to the last question, about how Hakuin had influenced your own lives. In another forum, it would be great to have more slides from the newest book (1050 Hakuin paintings), with an emphasis (as you did in this forum) on the religious motivations that prompted these works. Thank you for the conference. I had a wonderful time. I hope that there will be other conferences like it in New York. Americans know too little about Japanese culture. I found the Hakuin Forum extremely informative, interesting and productive! I believe there is much to be learned from such a study, including cross cultural perspective on the arts as well as the religion issues. Thank you very much! I only attended the conference for about one and a half hours, but I found it really good. My favorite parts were the beautiful brochures, the good translators, and the nice presentations. My main suggestion for improvement for next time would perhaps be to have more time for the speakers to give them more time to develop their ideas. For example, I would have loved to have learned more about different "Japonismes", and perhaps have had some Q and A right after, so that questions about each topic could have been cleared up before the larger panel discussion. But I did want to thank you for putting so much thought into this event. It was very appreciated, and I look forward to learning more about this topic I knew nothing about before. I also want to give u a HUGE THANK YOU for making the event free This really made the event more accessible. I attended the Hakuin Forum and I would like to thank you for bringing the conference to the United States. On an organizational level, I thought the simultaneous interpretation was an excellent choice. I have attended many conferences where Japanese speakers are forced to either speak in English or to not participate. I was particularly grateful to be able to listen to you and the other scholars during the discussion session. 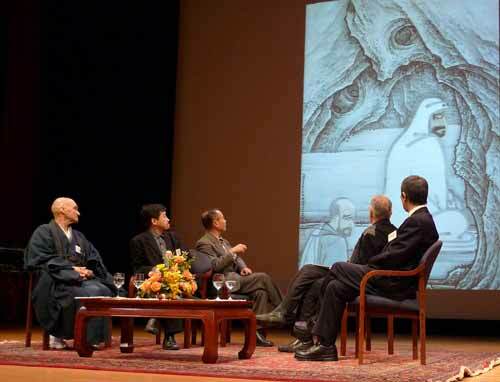 I rarely have the opportunity to see Japanese scholars engage in lively debate on art historical topics. Although I realize the forum was aimed at a general audience, I would have liked to hear the speakers present for longer than the 10-20 minutes they were granted. As each speaker acknowledged, it is difficult to presented a polished talk with significant scholarly content in such a short time. Perhaps if you make a similar presentation in the near future, you could allocate more time for each speaker, and consider omitting the DVD presentation from the schedule. As an alternative, you could direct the audience members to websites or stores where they can purchase or view the video by writing such information in the program, if you wished. However, I felt the conference was a good introduction to Hakuin's work and some of the issues that his paintings raise for those who study art history, Zen, or Buddhism more broadly, as well as for collectors, curators, and the general public. I should probably mention that I am a PhD student at the University of Pennsylvania in Philadelphia, specializing in Japanese art history. My own research belongs more within the framework of ukiyo-e prints and paintings, but my interests range widely. I was grateful to have the opportunity to learn more about Hakuin. I congratulate you on your work on Hakuin thus far, and wish you much success in the future. Copyright © 1995-2009 International Research Institute for Zen Buddhism. All rights reserved.